These adorable little glosses each contain the exact high-shine, non-stick, moisturizing lip gloss formula that full size glosses are made with. The collection features Balmshell's top 5 lip gloss colours and they fit perfectly into the smallest clutch purse so you can take them along every where you go! You can purchase this product online here or at selected Beauty Boutiques at Shoppers Drug Mart. I received this product in the Goodie Bag from the TBB event here. 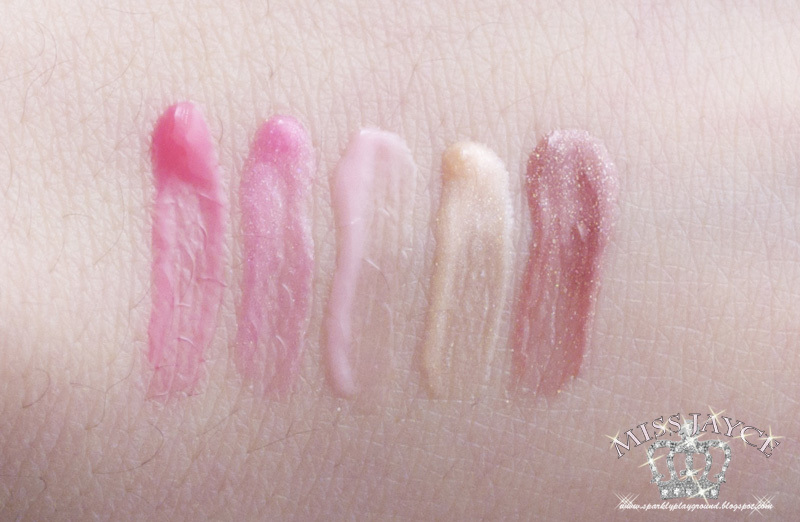 This is the cutest lip gloss product EVER! For the longest time, I thought Balmshell was quite a gimmick brand because of the cute packaging and catchy items. I never had a chance to try them for their quality until now. Cliche but true, never judge a book by its cover, because these lipglosses truly live up to its claims! These glosses are moisturizing and self blends so well. It's not greasy and non sticky as well. The doe tip brush is also perfect for application. I'm truly shocked that they turned out so good. They also do not run or create any lines on my lips. Its lasting power is about 2.5 hours. Each mini lip gloss last about 3-4 days for me until I entirely finish it. They do have a tint of vanilla but its not very noticeable. By the way, love that there are No Artificial preservatives and it's Paraben free! The price and size of this collection would be the only thing I would take note of. Let's do some Make up Math. The full size lipgloss (0.9oz or 27g) retails for $20 on the website and selected older editions are on sale on the Sephora site for $11. 5 mini lip glosses (a collection) should be $1.11 x 5 = $5.55. I think the retail price of $24 for a mini collection is outrageous especially when the mini sizes don't have those cute and fancy packaging! Thankfully, I received this from a goodie bag. I do think the collection is definitely a great item for people like myself to get to know the brand and its products. As a customer though, I would not consider this and simply buy the full size lipgloss. It's a great lip gloss (no doubt) and gosh, I really love the full size packaging! Packaging: 5/5 ♥ It's quite cute, no complaints as it's pretty good even for a sampler. Price: 0/5 ♥ Poorly priced.